This week, I’ll be highlighting an addon that helps you run a GDKP raid called GoldRaidManager. In case you’re wondering, GDKP is a style of raid loot distribution popularized by people on Korean MMO servers. Essentially, the way it works is that all drops are auctioned off to the highest bidder, and all the money gained this way gets split among all raid members at the end of the instance. Here’s the thread about it on EJ. 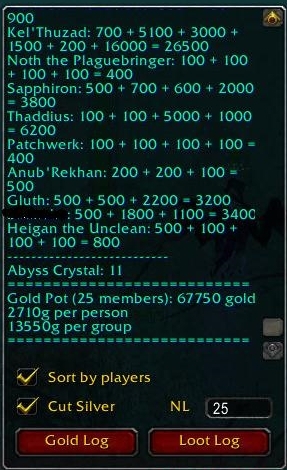 Now GDKP itself is not for everyone, but if your server has enough players who are geared to the teeth and farming ToC while working on ToGC, some of them might well be interested in going back into Naxx or Ulduar again if they could get 2700G from it. One FAQ I needed answered before I would even consider posting this is about ninjas with master loot- however, this blue post assuaged my fears. Basically, as long as the rules are stated in game chat (not vent), the GMs will consider any loot ninja a scammer, and make sure everyone gets their share. The resource site spotlight (aka wiki tiki utility posts) should happen every week, but is written by Euripides from outdps.com, and endeavors to fill your favorites bar with an unmanageably large quantity of WOW resource sites. So much knowledge that it hurts. Ow. Ow. Ow. Ow. Gold dkp runs « Holy Nova NOW!